Ever wondered what it’s like having two Steven Gerrards? On top of today’s confirmation that Liverpool legend Stevie G is now one of our own, Rangers fans mustn’t forget that not long ago we signed his spiritual successor, a man who his fellow Anfield greats had pinned as a truly extraordinary talent, a leader among men, and a truly exemplary example of a modern version of the midfield titan. 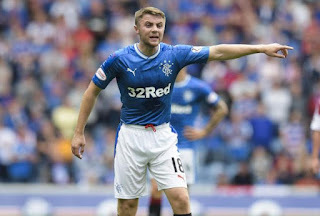 Jordan Rossiter has been at Ibrox for two wasted years of his career. Could there be a better manager for this special young talent to finally get the English youth captain back on track? Rossiter’s career has been a tragic case of what might have been, so far. The Liverpool youth player has shown plenty of how good he can be, but the anchor man’s time in the game has been completely blighted by one injury after another. It just so happens he has finally regained full fitness. Just in time for the man many observers say he is the spitting image of both in style and appearance to take over at Ibrox and finally get Rangers a midfield leader to be proud of. Rossiter has it all for a defensive midfielder – strong, quick, industrious, technically potent, a leader, gritty, hard-working, and willing to dig in not to mention his excellent vision, he is the modern symbol of what we need from our deep lying anchor – but his career simply has not got going thanks to incessant injuries. Jordan Rossiter could be a player completely reborn under Gerrard. The man he aspires to emulate is now his manager, and no one has better advice, guidance, and sheer tactical awareness of Rossiter’s position than Gerrard does – Rossiter could benefit more than anyone in Rangers’ squad from this bold new appointment. While Greg Docherty has been mostly excellent, and Rangers don’t lack for players at DM, there is a real vacancy in a new era for a fine young talent to nail that place down and become the kind of hard-working leader in there that Rangers absolutely lack. You don’t captain England at any level if you can’t lead. We here at Ibrox Noise gave up on Jordan Rossiter a long time ago. Now we can see the ingredients are now there for an unexpected renaissance. The boy Rossiter will have a lump in his shorts this week. If there’s one guy I would love to see come to the fore under Gerrard it’s he. That laddie has game. Tough, quick, aggressive, tackling, passing, leadership. Scouser. If the boy can stay fit he can achieve anything he wants in the game. Funnily enough I was thinking earlier he must be one of the happiest players alive Today, your boyhoid hero joins the club your playing for as your manager. He must be buzzing right now. Hope that's his nightmare behind him now, a month in the sun then get a good hard pre season into him, let's just see after that. U happy now Billy I never let U down? Yes would love to see him become a Rangers stalwart but seems he has frailties. Frankly this young man has been given saviour like status that he hasn't yet earned. Go prove me wrong son. He has it all to do for sure but the laddie has all the attributes in the locker & couldn’t be in a better place & time to do it. If he gets Injured again ... Cut Him Loose! I Agree with Steven Mccaloney, 2yrs is long enough!